Our team understands that experiencing severe oral pain and/or injury can be a frightening time, whether you are the victim or you’re watching a loved one struggle with serious symptoms. 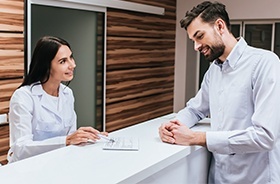 Here in Torrington, we do our best to accommodate dental emergencies as soon as possible so that patients are never left waiting without relief. Our team members can also provide guidance over the phone for how to stabilize your condition and minimize uncomfortable symptoms until you’re able to reach our dental office. Why Choose Torrington Dental Care for Emergency Dentistry? Is the pain consistent and dull or sharp and sudden? For persistent pain, start by cleaning around the tooth to remove anything that might be stuck between the teeth. If this doesn’t help, or if you are experiencing “jabbing” pain, apply a cold compress to the face and take an OTC-medication for temporary relief. Try to find and recover any large pieces of the tooth that you can and put them in a safe container until we can see you. To make sure that your remaining tooth doesn’t irritate the inside of your mouth, you can place some dental wax or a wet cotton ball over it. 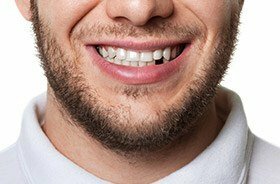 A knocked-out tooth can only be put back into place within an hour or so of the accident, so make sure you give us a call as soon as possible! Find the tooth, give it a gentle rinse, and try to set it back into its socket. If this isn’t possible, keep the tooth in a container of milk or saltwater—it needs to stay wet to keep it viable! Find the restoration, rinse it off with lukewarm water, and attempt to put it back onto the tooth. A little bit of toothpaste can help with this. If it won’t stay, be sure to cover the tooth either with dental wax or a wet cotton ball. Wear a mouthguard every time you play sports—sports-related accidents account for about 40% of all dental injuries! Don’t chew on extremely hard items like ice, pens, pencils, fingernails, etc. Don’t use your teeth to open packages or remove tags from clothing—go grab the scissors! Brush and floss your teeth every day to keep them strong and decay-free. Get checkups and cleanings at Torrington Dental Care every 6 months. These appointments will help us catch a small problem before it can become an emergency later! 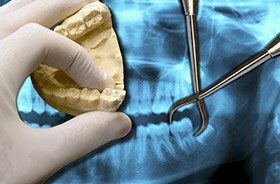 No two dental emergencies are exactly alike, and because of this, there is no single price for treating one. We’ll base our care on a patient’s particular situation and needs. 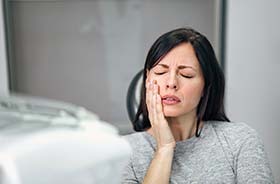 Some might just need a small filling, while others might require a root canal and a dental crown. Regardless, our goal is to relieve a patient’s pain first, and then we can discuss how they want to repair any decay or damage. To help with any out-of-pocket costs, low-to-no interest financing is easily available through our practice. 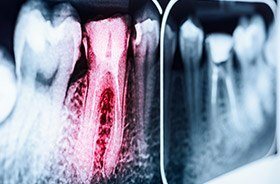 If you are experiencing severe sensitivity and/or outright pain in a specific tooth, there may be an advanced infection underneath its outer layers. Root canal therapy is the ideal method for revitalizing the tooth’s health and strength without requiring extraction. Our dentist will carefully access the tooth’s inner pulp chamber and root canal(s), removing diseased tissue and nerves. Teeth that are treated with a root canal can often remain a stable part of a patient’s smile for several more years. At Torrington Dental Care, we will do whatever we can to help our patients preserve a full set of natural teeth for life. Unfortunately, this approach isn’t always feasible or wise. Serious infection, traumatic injuries, and other circumstances can arise that make an extraction the best choice for your continuing wellbeing and safety. 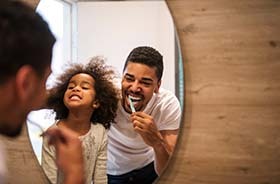 Your comfort will be prioritized throughout this process, and your dentist will work with you to devise the ideal reconstructive plan of action as needed to restore your complete smile right away.